Mangala Aarati in South India involves swirling a red-colored liquid during festivals and rituals and also to welcome newly wed couples, important persons and relatives. This ritual is mainly performed in Tamil Nadu, Karnataka and Andhra Pradesh. The red-colored liquid is waved in a salver, or flat vessel, and is performed to ward of evil forces and absorb jealous vibes. The ritual is also performed during Grih pravesh, wedding and upanayanam. Please note that Aarati is usually referred to the swirling of lamps before a deity. Mangala Aarati is specially performed during Varalakshmi Vratam to welcome Goddess Lakshmi. It is also performed after functions, important pujas and ceremonies to ward off evil. The red color solution for Mangala arati is prepared using turmeric, gypsum or Kumkuma. 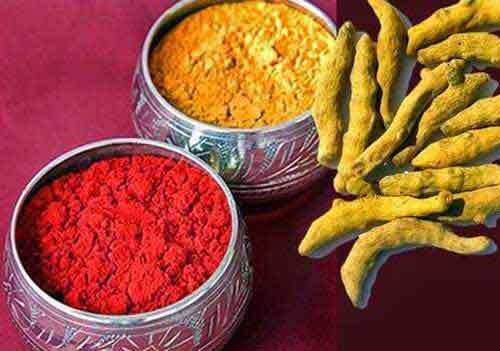 Water is added to the mixture of turmeric or gypsum to give a red color. The popular belief is that turmeric represents Goddess Lakshmi, and gypsum represents Goddess Saraswati and the red-colored solution that results from its mixture is Goddess Durga.